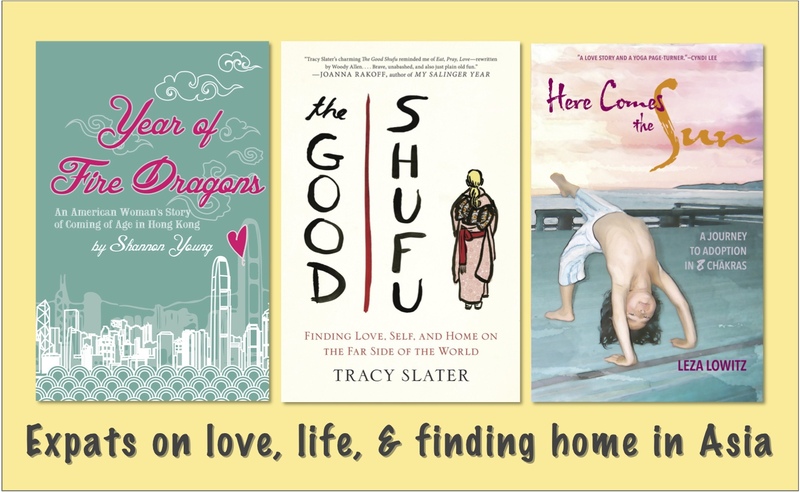 If you're like Writer Abroad and love a good travel/expat memoir–specifically one that deals with Asian cultures, go East, dear blog reader, go East. 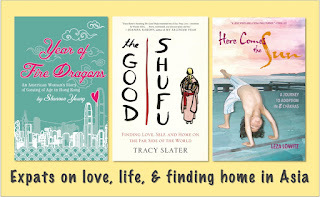 In June, three new memoirs by women writers were published. One of the books is by Tracy Slater, who previously contributed to Writer Abroad back in 2013. The Good Shufu is a true story of multicultural love, marriage, and mixups. When Tracy Slater, a highly independent American academic, falls head-over-heels in love with the least likely person in the world--a traditional Japanese salaryman who barely speaks English--she must choose between the existence she'd meticulously planned in the US and life as an illiterate housewife in Osaka. Rather than an ordinary travel memoir, this is a book about building a whole life in a language you don’t speak and a land you can barely navigate, and yet somehow finding a truer sense of home and meaning than ever before. A Summer ’15 Barnes & Noble Discover Great New Writers Selection, The Good Shufu is a celebration of the life least expected: messy, overwhelming, and deeply enriching in its complications. When a bookish 22-year-old follows her Eurasian boyfriend to his hometown of Hong Kong, she thinks their long distance romance is over. But a month later his company sends him to London. She embarks on a wide-eyed newcomer's journey through Hong Kong—alone. The city enchants her, forcing her to question her plans. Soon, she must make a choice between her new life and the love that first brought her to Asia. At 30, Californian Leza Lowitz is single and traveling the world, which suits her just fine. Coming of age in Berkeley during the feminist revolution of the 1970s, she learned that marriage and family could wait. Or could they? When Leza moves to Japan and falls in love with a Japanese man, her heart opens in ways she never thought possible. But she’s still an outsider, and home is far away. Rather than struggle to fit in, she opens a yoga studio and makes a home for others. Then, at 44, Leza and her Japanese husband seek to adopt—in a country where bloodlines are paramount and family ties are almost feudal in their cultural importance. She travels to India to work on herself and back to California to deal with her past. Something is still not complete until she learns that when you give a little love to a child, you get the whole world in return. The author’s deep connection to yoga shows her that infertile does not mean inconceivable. By adapting and adopting, she transcends her struggles and embraces the joys of motherhood. Keeping in apperception these advantages, one can consistently opt for online payday banknote beforehand accommodation aback in charge of burning banknote at emergency situations. Online payday accommodation lenders are consistently accommodating to accord abroad accommodation instantly. So stop cat-and-mouse and administer now. Highly very clear clarification with challenges is definitely supplied plus it’s accessible to any lifestyle intellect. Concerning perused a person's posting; definitely you may have with all this astonishing enlightening details regarding this. At this moment please click here Cash Advance Have fun once for all deliver the results. Stay the best. Moving to paid hosting is a acute move. It liberates you from annoying ads and limitations imposed by chargeless hosting websites. By thinking, alteration from chargeless to paid web hosting sounds easy. This activity is abnormally accurate back you already accept a little acquaintance on chargeless hosting sites like Geocities or Bravenet. The accuracy is, allotment a hosting amalgamation is a database backup allotment of block but business-wise, it's a bit added arduous than you anytime thought.